Ayacucho is the capital of the Ayacucho Region in Peru. The origin of the name Ayacucho is said to come from words in Quechua that mean "city of the dead". The city was founded in 1539 as San Juan de la Frontera de Huamanga by Spanish conquistador Francisco Pizarro, who chose the location to bridge the distance between Lima, and Cusco. The Frontera (border or frontier) name was an allusion to its then-status as the "last frontier" between conquered Spanish territory and territory still controlled by Manco Capac II and his vassals. Years later, following the eventual defeat of Manco's vassals, the name was changed to San Juan de la Victoria de Huamanga. During the Peruvian War of Independence, the area surrounding Ayacucho was the last territory held by the Spaniards. On December 9, 1824, the Battle of Ayacucho, or "La Quinua", took place at Pampa de La Quinua, few miles away from Ayacucho, near the town of Quinua. This battle – between the royalist (Spanish) and nationalist (republican) troops – sealed the independence of Peru and South America. The nationalist republican forces were lead by Antonio Jose de Sucre, Bolivar's lieutenant. The nationalist army defeated the colonial regime, so Bolivar changed the city's name to Ayacucho. After the battle, Viceroy Jose de la Serna signed the final capitulation whereby the Spanish agreed to leave Peru. Our Peru Travel Package	is unique and it has everything you need! 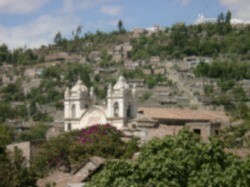 Ayacucho is known as the city of 33 (colonial) churches, such as Santo Domingo, San Agustin and San Francisco. The oldest churches in the city were built in the 15th century, and contain Spanish, Latin and Moorish influences. During the late 1970s, Ayacucho was the site where guerrilla communist insurgents of the Shining Path, led by Abimael Guzman, started waging war against the Government of Peru by masterminding some of the worst terrorist activities in the history of the country.